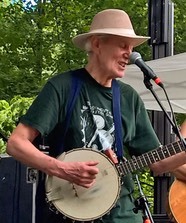 Now Pete had put that song into The People’s Songbook back in the 1940s, and it was called "We Will Overcome," and he had learned it from the striking tobacco workers in North Carolina. So that’s the song that the kids were singing when they came from Highlander up into Topanga. At that time I had been attending the St. Paul Baptist Church in Los Angeles on Central Avenue. St. Paul’s had a one hundred piece choir, a Black choir, singing songs like “Precious Memories How They Linger,” and they had this very strong Gospel rhythm. And I remember hearing that organ roll and that one hundred piece choir. 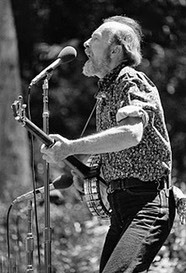 It was so impressive I took Pete Seeger down there. I just loved the music. I heard about it on the radio, at the end of the dial. That’s where you heard the “good” music. MARK DVORAK: So you went to St. Paul’s on a Sunday to hear the music at the church service? FH: Oh yeah! Absolutely! It was really quite an experience because this group, this hundred piece choir and that organ player, they just filled that cavernous sanctuary which had neon crosses and the glitz and everything. The matrons were all dressed in white, and the people would freak out. They’d find Jesus and they’d get down on their knees. They’d roll around on the floor and holler and yell. Then everybody would go out after that and have Sunday morning breakfast. And I thought, “My goodness, that’s an interesting form of psychotherapy.” I’d never thought about it that way. So Pete had added this song in The People’s Songbook in the 1940s. He was aware of the song then, when it was called “We Will Overcome.” And it was sung in a very sing-songy way in 6/8 time. And this is the way the Highlander Center kids also sang it when I heard them in Topanga Canyon. So I started messing with the chords and began jamming with the tune, trying to get the chords down and the rhythm that I remembered hearing at St.Paul’s. By then I was singing at parties in the Los Angeles area and slowly it all began to come together. Guy and I grew up in Los Angeles and we were singing partners for a while. Guy was a very handsome young man with a beautiful tenor voice. He went to John Marshall High School and wore white buck shoes and his letter sweater. 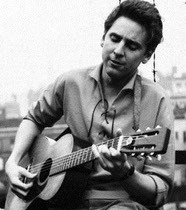 Guy would sing show songs like “Hello Young Lovers” and play it on his ukulele. This was in the 1950s. So Guy wanted to learn this song from me. And I gave him the chords and tried to show him the feel I thought the song should have. Guy learned it and he took it with him when he went to Greensboro, North Carolina for the first sit-in movement. This was the first major Civil Rights demonstration. It was a lunch counter sit-in that took place around 1960. Guy sang “We Will Overcome” to everyone at the demonstration and as I understand it, they began to request it because they wanted to learn it. And then I added “we are not afraid.” The Klu Klux Klan came and literally burned down the Highlander Folk School in Monteagle, Tennessee. The school finally moved to New Market, Tennessee. Guy popularized the song. And when the Black people heard that Gospel thing in the rhythm, they identified with it. They said, “That’s our song.” And Guy had the musicianship to pull it off. He delivered it with the 12/8 feel. MD: Was Pete actively singing “We Will Overcome” when he put it in The People’s Songbook? FH: Yes his knew it and was actively singing it, but he didn’t sing it with the Gospel feel. He was singing it straight 6/8 and kind of white, is all I can say about it. It wasn’t a big song then. Nobody thought very much of it. FH: That’s right. Bernice Reagon and the Civil Rights singers, I’ve forgotten all their names now, but they all sang it. And they toured singing it. And then of course it found its way into the churches throughout the South. MD: I had heard a story where Pete had come to Highlander Center in the 1960s during Civil Rights when Highlander became a gathering place and a refuge for people who were marching. And Pete heard people singing the song there, and that’s when he rediscovered it. FH: That’s right. He rediscovered it. FH: With the Black feel. MD: Is that when Pete added to his repertoire? 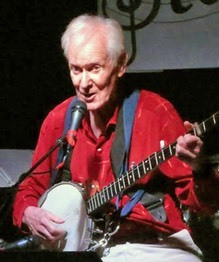 MD: The composer credits for the song are Pete Seeger, Zilphia Horton, Guy Carawan and Frank Hamilton. How did it come to be that there are four people credited with the composition? FH: Well, I taught it to Guy and Guy got me on the copyright. Pete went along with it apparently because he knew Guy. And that was my contribution, anyway. Guy put me on the copyright, sent me the release forms and I said, “sure,” and that was it. MD: Do you earn any residuals from the song? FH: No. What happened was Pete sent me a form that said this song really belongs to the Black people. Originally they wanted the money to go to Dr. King’s organization, the Southern Christian Leadership Council. So that’s where the money went and I signed my share over to them. Then Highlander took over when the SCLC dissolved. So the money went to finance Highlander. And I thought that was really appropriate and that’s the way it should be. So I never made a lot of money from the song. Nobody got rich from that song. MD: Well, we all got rich on that song! But I was part of it. It’s a folk song because it was made by many hands, sung by a lot of voices. It’s an important song in American history and the real important thing is that it doesn’t belong to anybody. “We Shall Overcome” belongs to everybody. 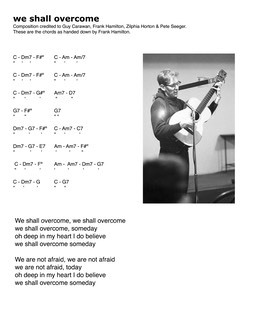 Click on the image to download and print the Frank Hamilton’s chord progression to “We Shall Overcome." 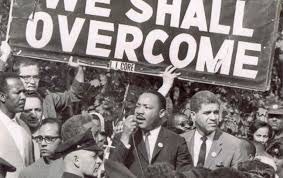 Click on the image to listen “We Shall Overcome” from the book/CD compilation Sing For Freedom: The Story of the Civil Rights Movement through its songs by Guy and Candie Carawan.